Warning: There are spoilers ahead for Birds of Prey! 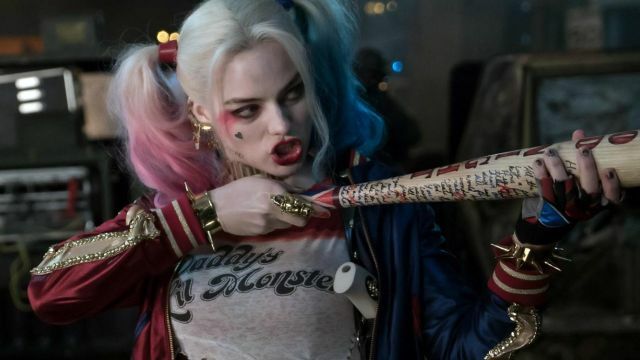 The Birds of Prey is less than a year away, but fans of Harley Quinn are already getting a hint about her new adventure. A new batch of photos from the set features Margot Robbie’s Harley Quinn as she breaks up with the Joker. She also watches helplessly as he flings her belongings out the window of their house. Despite not having a clear image of the Joker’s face, it seemingly confirms he will make an appearance in the movie. Jared Leto recently teased his return as the Joker. However, he is filming Morbius The Living Vampire in England at the moment. A few of the shots show Harley outside after her eviction. Notice that she doesn’t look too sad about this turn of events. In Birds of Prey, Harley joins forces with Black Canary (Jurnee Smollett-Bell), Huntress (Mary Elizabeth Winstead), and Renee Montoya (Rosie Perez) to help protect Cassandra Cain (Ella Jay Basco) from Black Mask (Ewan McGregor). The movie also stars Charlene Amoia as Maria Bertinelli, Chris Messina as Victor Zsasz. Steven Williams, Derek Wilson, Dana Lee, François Chau, Matthew Willig, and Ali Wong have been cast in undisclosed roles. Cathy Yan is directing Birds of Prey from a screenplay by Christina Hodson. Birds Of Prey soars into theaters on February 7, 2020. What do you think about these set photos of Birds of Prey? Let us know in the comment section below.